Team photograph. First row: Kathy Koshansky (trainer), Julie Gilmore, Diane Abrey, Ramona Benjamin, Karen Blend, Bev Carter, Mary Ortelee, Debbie Drabinsky, Beth Davidson. Second row: Sharyn Madison (asst. 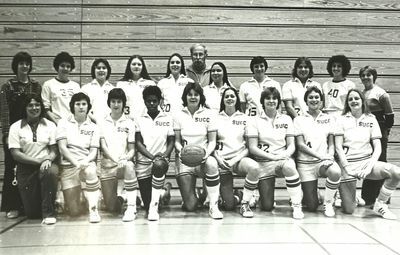 coach), Katie Mooney, Tish Fahey, Linda Shrauger, Lori Slaght, Mary Anne Jules, Pat Kugler, Cheryl Monica, Heather Harrington, Denise Kiser (manager). Third row: Roger Sipher (head coach).